How to get there virtual tourist guide to your Hong Kong Disneyland journey. One of the greatest Hong Kongtourist attractions, offering a perfect full day entertainment for the whole family. 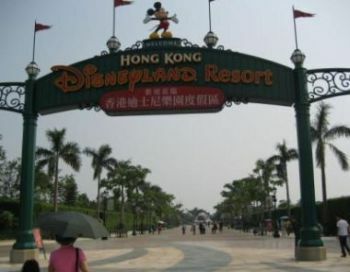 Welcome to the fifth Disneyland on the planet - the Hong Kong Disneyland (here's to see HK Disneyland interactive map) opened to visitors on September 12, 2005. Hong Kong is one of the most popular cities for travelers to China and Disney took advantage of this fact by adding a new spectacular Hong Kong attractions, a new Disneyland building venue with a total capacity of 34,000 people. the daily parades with Disney characters on Main Street. Space Mountain is always expected to have the park's longest lines so Travel Hong Kong Attractions suggest you take it first to maximize your time. If you are treating your kids it is best to start with Dumbo instead and then Winnie the Pooh. Disney's Hollywood Hotel. There is a wide range of dining and shopping options. Here are some options in getting directly to Disneyland Resort from the airport. It's only about 40 minutes bus ride and a wise choice, not only fare-wise but also, during the trip, you can start right away seeing the beauty of Hong Kong. Secure your seat in the bus' upper deck preferably any seat in front and get ready with your video recorder, you are going to see a very scenic bus trip passing through the famous Tsing Ma Bridge, the Hong Kong Airport actually has also a very spectacular structural view, one of the world's best airport. A great way to reach Disneyland from the airport is to take any bus number with a prefix letter A or E to the Lantau Link Toll Plaza where you change over to a number of Hong Kong Disneyland bus routes. Take Bus No. A31 from Airport (GTC) Bus Terminus to Lantau Link Toll Plaza, 13 minutes - HK17.8, then take the Bus No. R42 to Disneyland Bus terminus, 27 minutes - HK$21. Take Bus No. A41P from Airport (GTC) Bus Terminus to Lantau Link Toll Plaza, 13 minutes - HK26.1, then take the Bus No. R42 to Disneyland Bus terminus, 27 minutes - HK$21. Take Bus No. A43 from Airport (GTC) Bus Terminus to Lantau Link Toll Plaza, 13 minutes - HK29.2, then take the Bus No. R42 to Disneyland Bus terminus, 27 minutes - HK$21. Take Bus No. A22 from Airport (GTC) Bus Terminus to Lantau Link Toll Plaza, 13 minutes - HK39, then take the Bus No. R42 to Disneyland Bus terminus, 27 minutes - HK$21. Take Bus No. E32 from Airport (GTC) Bus Terminus to Lantau Link Toll Plaza - HK10.5, then take the Bus No. R8 - HK$7 to Disneyland Bus terminus, 64 minutes total bus travel time (cheap but it takes more time). This is also a very efficient way in getting to Hong Kong Disneyland Resort from the airport. Take a bus to Tung Chung area then taking the Tung Chung MTR trains to Disneyland station. Take Bus No. A35 from Airport Urban taxi stand to Fu Tung Shopping Centre. Walk to the nearby Tung Chung MTR station (Entrance / Exit D) and take the trains to Sunny Bay station then interchange to Disneyland Resort Line to Disneyland MTR station, 38 minutes - HK$26.6. Take Bus No. E22B from Airport (GTC) Bus Terminus to Citygate, Tat Tung Rd. Walk to the nearby Tung Chung MTR station (Entrance / Exit C) and take the trains to Sunny Bay station then interchange to Disneyland Resort Line to Disneyland MTR station, 38 minutes - HK$35.6. Take Bus No. S56 from the Passenger Terminal Building, Cheong to Tung Chung MTR station. Take MTR station (Entrance / Exit B) and take the trains to Sunny Bay station then interchange to Disneyland Resort Line to Disneyland MTR station, 42 minutes - HK$15.1. Take Bus No. E22A from Airport (GTC) Bus Terminus to Citygate, Tat Tung Rd. Walk to the nearby Tung Chung MTR station (Entrance / Exit C) and take the trains to Sunny Bay station then interchange to Disneyland Resort Line to Disneyland MTR station, 45 minutes - HK$60. If you prefer, you can also take the Airport Express Trains from Hong Kong International Airport at MTR Airport station to Tsing Yi station. 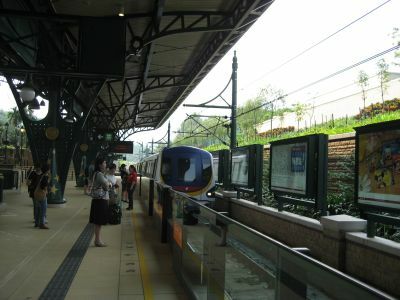 Then from Tsing Yi station, take the Tung Chung / Disneyland Resort Line trains towards Tung Chung. You should get off at Sunny Bay Station and interchange trains to the Disneyland Resort Line for trains going directly to Hong Kong Disneyland MTR station, 33 minutes - HK$60. Buy your tickets at the Hong Kong Disneyland Ticket Express, located at the MTR Hong Kong Station's Tung Chung Line Concourse or at Disneyland main entrance ticket office. Take any MTR Trains (please read train safety tips) from Lo Wu station to Sheung Shui station, 7 minutes - HK$19.5 and take Exit D towards LANDMARK North Shopping Mall where you will find the bus station which is located only a few meters after you exit along the San Wan Rd. - do NOT cross on the road. Get on the KMB Bus No. 279X to Tsing Yi Bus Terminus for 38 minutes bus travel - HK$13.2 and then walk to the nearby Tsing Yi MTR station. Get on the Tung Chung Line / Disneyland Resort Line trains towards Tung Chung and get off in the next station - Sunny Bay, and finally, interchange trains to the Disneyland Resort Line to Disneyland for 16 minutes total train travel time - HK$11.6. Take the MTR Train to Sheung Shui Station, take Exit D towards LANDMARK North Shopping Mall where you will find a Bus Station. Get on the Bus No. A43 Airport Express Bus to Lantau Link Toll Plaza, 25 minutes - HK$29.2, get-off and change to Bus No. R8 to Disneyland Bus Terminus, 16 minutes - HK$7. Take the MTR Trains from Lo Wu station to Shatin station, 30 minutes, HK$24.7, take Exit A towards the Shatin New Town Plaza hopping mall and go to the ground level Shatin Central Bus Terminal via the escalators. Get on the KB bus No. R42, 43 minutes bus travel time all the way to Disneyland Bus Terminus - HK$21. OR, get on the Bus No. A41 or A42 (A41 is faster with only one stop) Airport Express Bus to Lantau Link Toll Plaza (HK$13). Get-off and change to Bus No. R8 or Bus No. R33 (much expensive) to Disneyland Bus Terminus - HK$7 and HK$21 respectively. All MTR trains route: Take the trains from Lo wu station to Kowloon Tong station, interchange trains to the Kwun Tong Line towards Yau Ma Tei. Get off at Prince Edward station, go to the opposite side and get on the Tsuen Wan Line towards Tsuen Wan. Get off at Lai King station and change to Tung Chung / Disneyland Resort Line towards Tung Chung. Get off at Sunny Bay station and finally, get on Disneyland Resort Line to Disneyland station, 77 minutes total train travel time - HK$47.5. Disneyland Resort Line Train to Disneyland. A very comfortable and specially designed train. 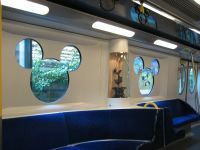 It has Mickey Mouse windows and lovely soft couches for a very comfortable ride. Hong Kong Serviced Apartments and Serviced Offices - Provides serviced apartments apartment-hotels and serviced offices in Hong Kong. City Guide and directories, Online Reservation, photos and virtual tours. General Information and Useful links for expatriate families and business travelers. "What's NEW in Hong Kong Disneyland?" "It's a small world ride"
The advent of Disney's "It's a small world ride" is attracting more visitors and mainly families and young children in Hong Kong Disneyland. The boat ride, a fixture at Disney's other parks, officially open to the public last April 28, 2008 in the Fantasyland area. The ride can accommodate up to 24 boats, each carrying as many as 23 people for a nine minute journey. The queuing area could hold about 1,200 people and the ride can handle 3,680 people an hour. The attraction features 220 toys and 241 audio-animatronics dolls representing the countries of the world, including 38 Disney characters such as Peter Pan, Aladdin and Mulan. Unique to Hong Kong's updated and expanded version is the addition of a Chinese opera character. The theme song accompanying the ride, Â¡Â°It's a Small WorldÂ¡Â±, is sung in nine languages, of which Cantonese, Putonghua, Tagalog and Korean are new additions. A visit to HK is NOT complete without a stop at Disneyland. Do you want to ask or share something about Hong Kong Disneyland? how about getting there from the place you stay in Hong Kong? What is the fastest way to Disneyland from renaissance hotel. Thanks! And how do we get to Ocean Park from same hotel. Hello, Can you please help me get to sky100 from Disneyland? Thank you so much. HK travel directions and transportation inquiry. Hi, How to get from Alisan Guest House to HK Disneyland? Also, from Hong Kong Disneyland to Ocean Park? Thank you.